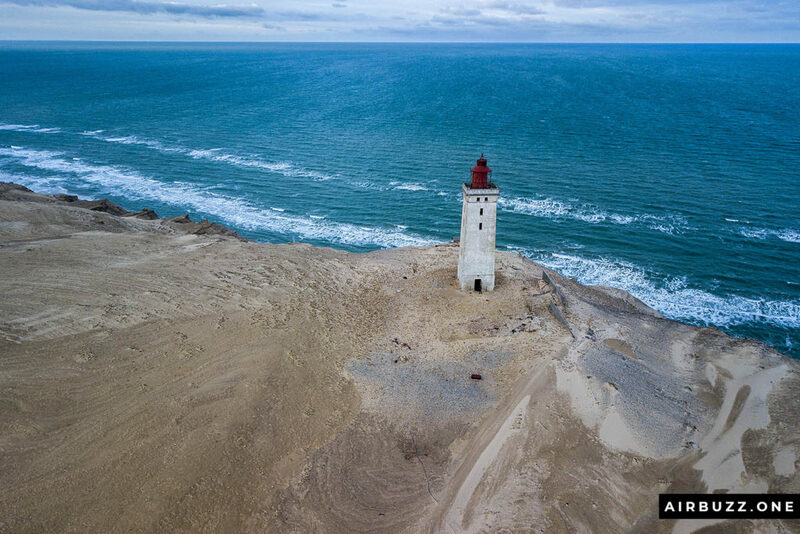 Rubjerg Knude Fyr – An abandoned lighthouse in Denmark that soon will be gone! 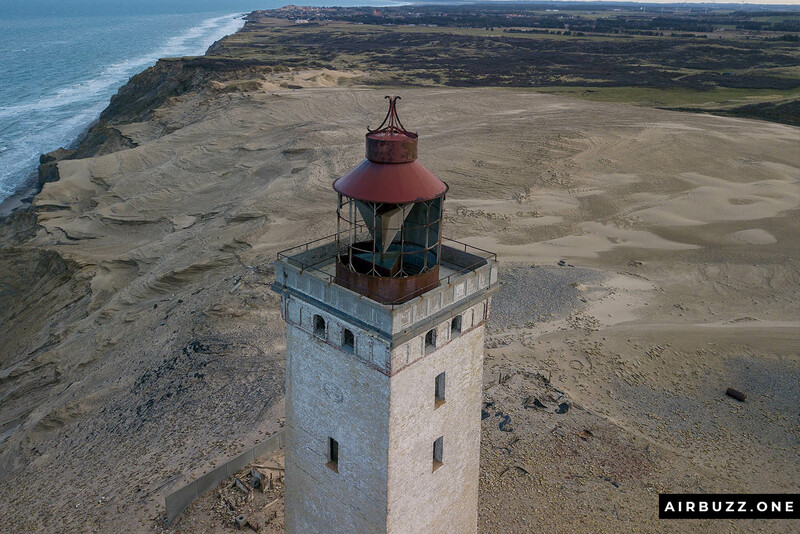 Drone photos of an abandoned lighthouse in Denmark called Rubjerg Knude lighthouse! 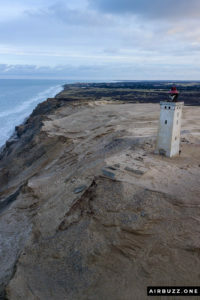 I recently went for a weekend trip to the west coast of Denmark on family business. I managed to get up early when it was still dark. 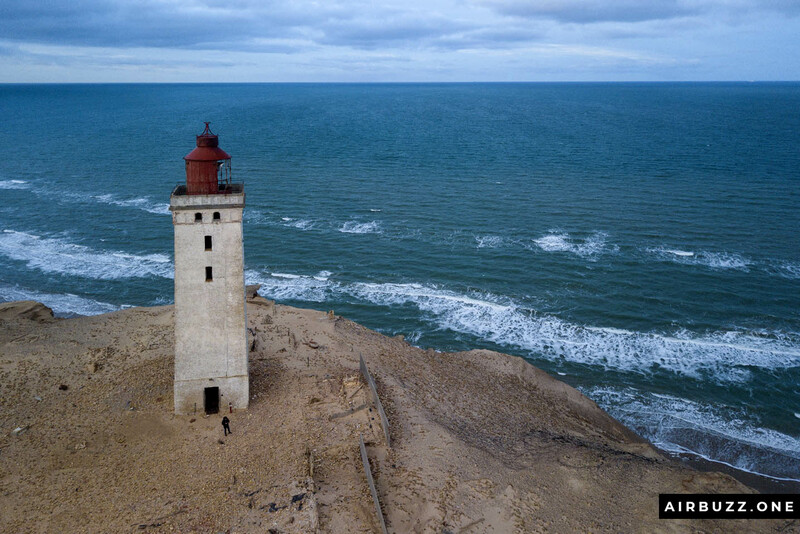 My goal was to photograph an abandoned lighthouse called Rubjerg Knude lighthouse (Rubjerg Knude Fyr) in the sunrise. It was a 20 minutes drive to the parking and then 10-15 minutes walk to the lighthouse itself. It was a great morning with no other people around so I could take my time and shoot both ordinary pictures with my Canon DSLR camera and drone shots afterward. 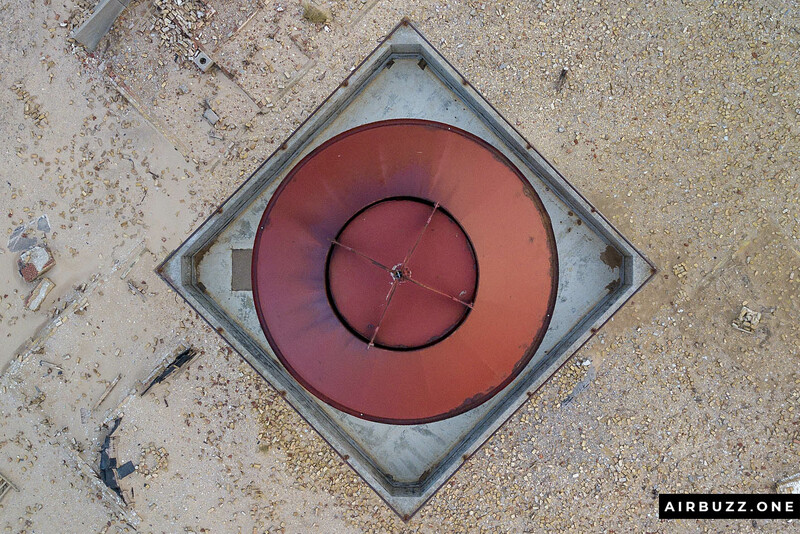 Check out my ‘no-drone’ photography here. Previous article: The new DJI Smart Controller is expensive but amazing! The lighthouse was visible a great distance away looking lonely and eerie in the dark. 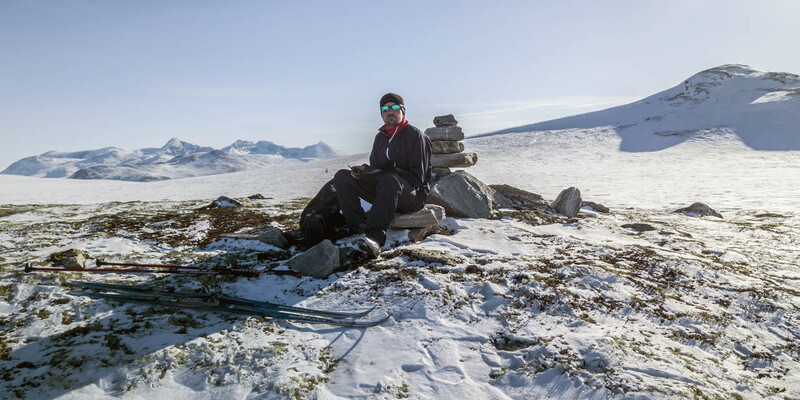 I walked over frozen sand dunes and soon arrived at the location. 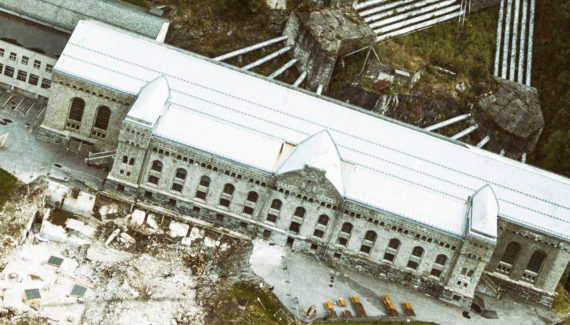 Rubble, bricks, and trash were spread around the tall building. It was amazing to see all the bricks in the sand scattered over a large area. These bricks came from a couple of buildings near the lighthouse that’s not there anymore. I was a little bit worried about the strong wind from the North Sea… could my small DJI Mavic Pro photography-drone handle it? Lighthouses were once an important part of ship navigation. The ability to stay clear of the land and be warned by light and sound was crucial for safe travels. 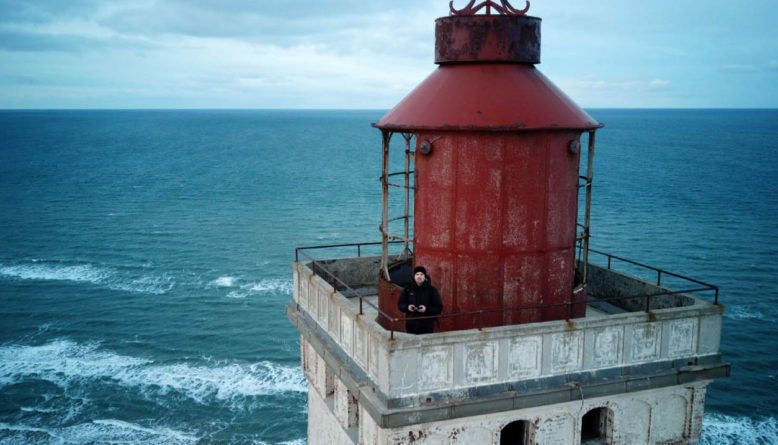 This lighthouse was build in 1899 and is 23 meters tall. The lens system with a 550 watts light source rotated at a speed of two turns per minute and sent out a double flash and a single flash, that lasts in one-fifth of a second each, in each turn. The range of the light out to sea was about 42 kilometers. 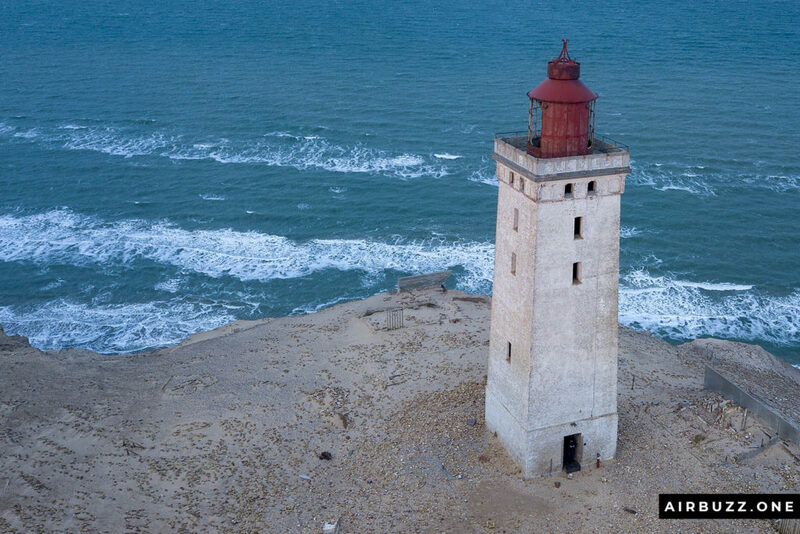 The lighthouse was also equipped with a foghorn fifteen meters above the ground on the western side of the lighthouse to warn heavy ships that were too close to shore. 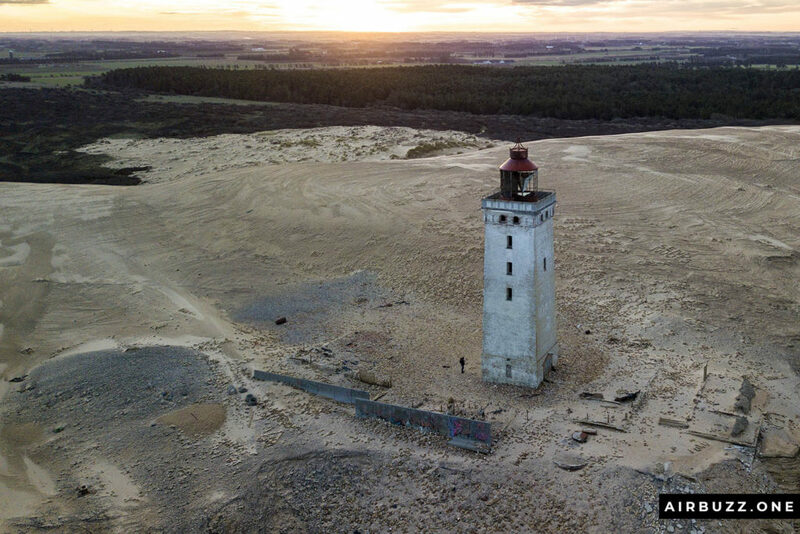 In 1968 it was abandoned due to huge sand dunes that covered the buildings. In later years the huge dunes are gone together with the crushed surrounding buildings. Only the proud tower building remains. After reading this, check out my next stop on this trip, a bunch of old concrete bunkers from the Second World War on the beach below. How much wind can DJI Mavic Pro handle? 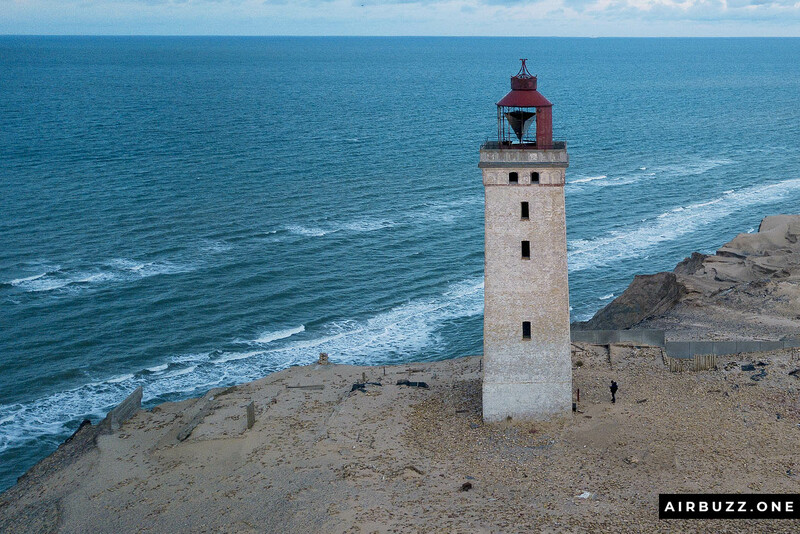 Even if I thought the wind conditions at the cliff was a bit tough and I was almost prepared to lose my drone, I sent the Mavic up in the air. I read the constant message on the controller: High wind velocity, land ASAP… but I didn’t. As you can see from the video at the bottom of the article it kept its position real steady and manage to shoot awesome photos and video. 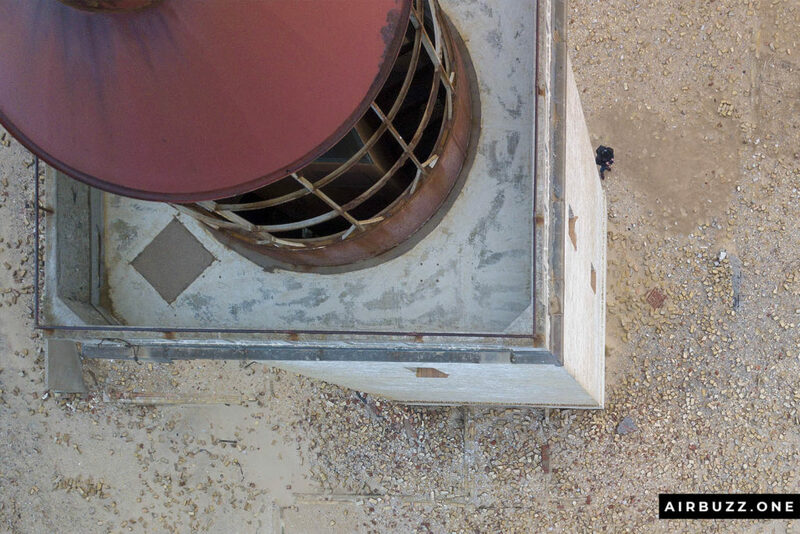 Unfortunately, I didn’t have any tools to measure the wind speed, but the drone kept a sideways angle of at least 40-45 degrees to stand the wind. It managed to fly slowly upwind, out to sea… and very fast in the opposite direction. I’m so amazed by how it can handle wind, but I wouldn’t dare flying in these conditions near other people or in denser locations. Here is a short video with music and historical facts I made from 4K clips shot with my DJI Mavic Pro. Pretty amazing how the drone handled the wind so well, even if you can see by the tilted horizon that it worked hard to stay stabilized and still in the wind. 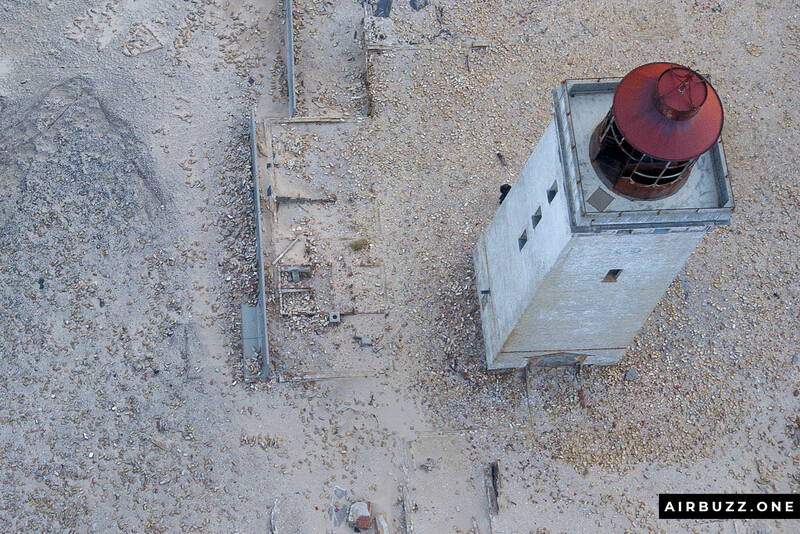 Here are a few pictures shot with the DJI Mavic Pro quad around the lighthouse. Hope you like them. Some of them are a bit similar, but I simply had a hard time selecting. Rubjerg Knude Lighthouse shot with a drone. The cold North Sea in the background. 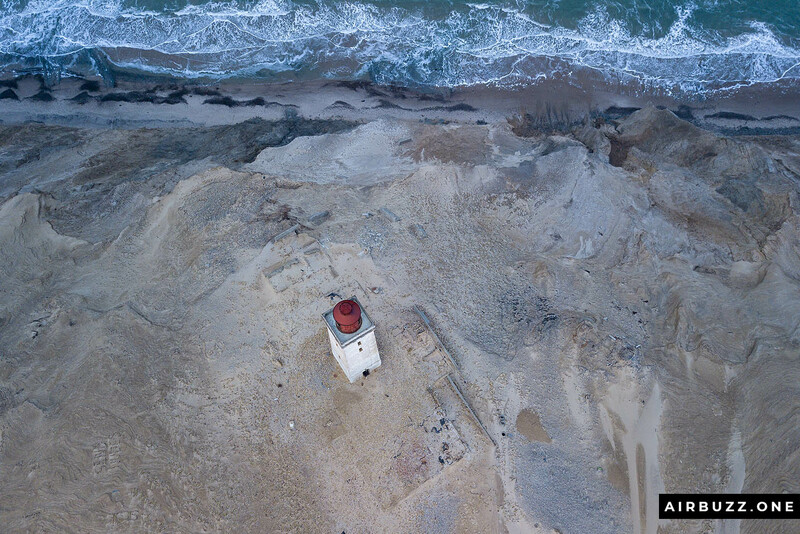 The large sand dunes that once made the lighthouse abandoned are gone. Lots of bricks and the remains of old buildings. Why is there so much sand in this exact, small area? Fascinating shot of Rubjerg Knude Fyr from the air. Check out my cool image of the lighthouse from the ground, shot with my ordinary DSLR camera in the sunset in my photostream on Flickr. See you next time! Hope you enjoyed the post. The two new DJI Mavic 2’s are finally officially released! What are the differences? A surprisingly high cliff, a tall Waterfall, and a historic Powerplant!